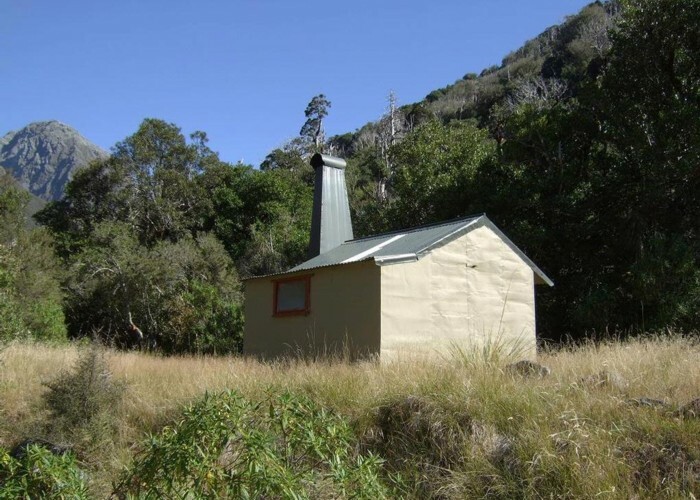 A 1950's era NZFS cullers hut on the TL of the Whitcombe River just over a km downstream from where the Wilkinson River joins the Whitcombe R. This hut is on the opposite side of the river to the track that heads to Whitcombe Pass. A long swingbridge crosses the Whitcombe from this track about a km below Cave Camp. (This is on the Price Flat - Neave Creek section) It is not far downstream from the end of the swingbridge to the hut. The hut is in good condition for its age and has had a few upgrades over the years. This hut gets some spill over usage from trampers visiting the Whitcombe Pass but is primarily used by hunters. Thar, chamois & red deer are to be found in the vicinity. A few mountaineers and serious trampers also make some use of the hut. Because it is a two day walk from the roadend to this hut some people fly in. Wilkinson hut April 2012 • By glennj. Licence: C.
Easiest access is via the swingbridge and track from the main valley Whitcombe Pass track that travels the TR of the Whitcombe River up from Price Flat to Neave Creek. The bridge is closest to the Neave end about a km below the Cave Camp rock bivvy. There is a route from Wilkinson hut down the TL of the Whitcombe River then up and over Pahlow Ridge to Price(s) Basin hut. Added 12 July 2011 by glennjglennj. 1 revision 12 July 2011 by glennjglennj. 37 views in the past year (3 per month).